Every year, I give myself a break. After five years of blogging, I learned that the best way to avoid writer’s burnout—at least when it comes to KLWightman.com—is to step away from my blog for a month. I press pause when I need it most. Last year, it was in May. This year, it was in July. I seem to need a break when the weather gets warm. But this year, I didn’t step away completely from my blog. I wanted to make the most of this break by monitoring the digital data that I gather behind the scenes. Normally I monitor my blog’s analytics to see if I’m writing the blog posts that my readers want to read. Over the past few weeks, I wanted to see if I could maintain readership on my blog. So I monitored how many visitors came to my blog and which blog posts gained the most views. The results were—and weren’t—what I expected. Did Readers Still Find My Blog? This is a snapshot of my blog’s weekly visitor count by week since the beginning of this year. I published and promoted a new blog post for every week shown here—except for the last four bars. Let’s zoom on in on the last five weeks. Notice how strong my viewership is in the first bar. 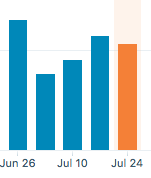 And what a difference in the second bar representing the first week I decide not to blog—it drops down by almost half! During Week 3 of not blogging (the bar just left of the one in orange), I decided to test something out. I promoted previously published blog posts on Twitter to see if it would affect my blog’s readership. Hence the jump in views. Which Blog Posts Are Still Relevant? The results here were just as I expected. My most popular blog posts still brought fresh eyes to my blog. And since I didn’t blog for a few weeks, I got more insight on my new readers’ user experience of KLWightman.com. They read the popular blog post, then return to my blog’s homepage to scroll through my latest feed. They often clicked on a recent blog post, usually my last post. Lucky for me, I wrote a blog post that received good feedback from my online community. So it was by chance or synchronicity that a blog post readers actually want to read was at top homepage billing. Turns out my time away wasn’t all in vain. While my blog definitely took a hit in terms of digital stats, I now have a better understanding of my new and returning readers. That means more relevant blog posts for you in the future! New blog posts keep my fans returning to my blog. Popular blog posts still draw in new readers, but only keep them clicking if my most recent blog posts are relevant to their interests. Don’t underestimate the value of sharing older blog posts on Twitter. What have you learned when you stop blogging for a week or three? Share your experiences in the comments section below. I was actually planning to write now, I ended up stuck in your posts. For starter, I’m not famous and last month was my first time to post on WordPress. My first post got 8 visitors, and for an amateur like me, it’s big deal. I was motivated to write more because my first try gave me a visitors and a follower. However, I was pressured to write better content compared to the first one. I stopped for two week (I guess) then I forced myself to write a blog about self-esteem and self-confidence. I didn’t get the same satisfaction. A month a the day I posted my first blog, I reviewed my blog statistics and it showed me that my readers disappeared when I also stopped writing. Now, your blog taught me that writing regularly is the key. Thank you for your helpful blog posts.